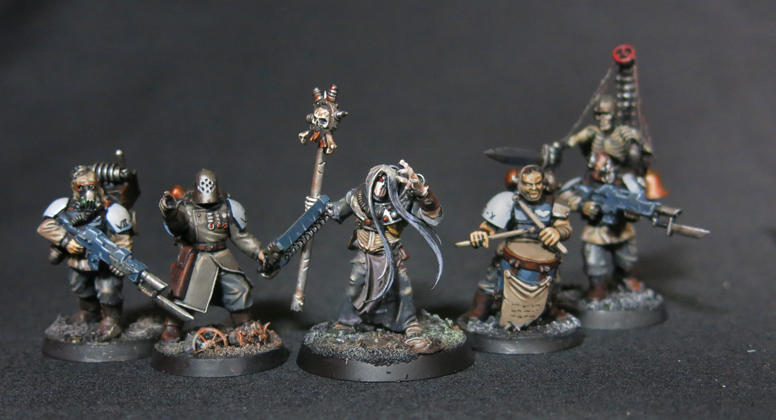 It’s the end of February and time once again to take a look at what I’ve added to my Skaven horde this month. 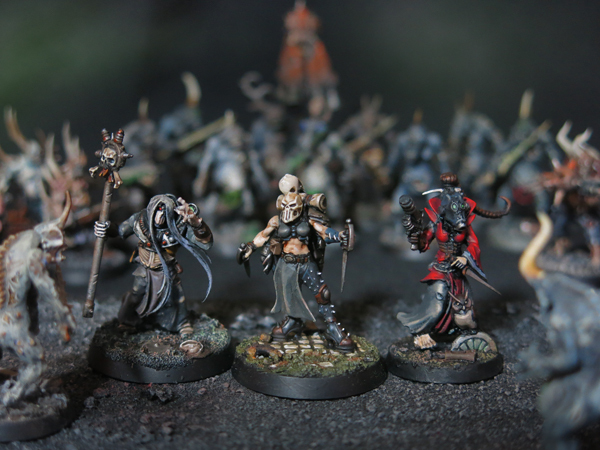 This time I’ve only managed to finish one miniature, but on the other paw it’s not just anyone – it’s Clan Eshin’s finest, the greatest assassin of the Old World (yeah, you heard me Shadowblade); Deathmaster Snikch. Not many Skaven get to be imposing yet Snikch manages it. Sadly before he reached me the elegant swirl of his cape had become caked in a foul mix of uncured greenstuff, glue and fluff so I snipped it back, which also helps to make him a bit more gritty and realistic. I actually found the little rats on his base were a lot of fun to paint. Often these smaller vermin are quite lumpen and lacking in detail (unsurprising as they’re downright minute) but these are actually quite sharply detailed and about as full of character as a base-detail a few millimetres long can manage. In spite of my ongoing real-life business eating in my hobby time like a tyranid hive fleet with a particularly tasty planet I’ve still managed to get both my Fembruary models finished before the end of the month (cue a little self-congratulatory back-patting). Alongside the witch I showed previously I also wanted to finish off this assassin, who also serves as part of my contribution to the Nestorian Infestation. Rather than repeat myself too much those who want to know what Fembruary is should look here, those who’re interested in the Nestorian Infestation can read all about the infested population here, and those who want to know why when the brief calls for genestealer infested civilians my first contribution is neither a genestealer nor a civilian can see me justifying myself here. Now Fembruary has started me thinking about few female miniatures I have in my collection, although given that so few of my models are even human (Space Marines non-withstanding) I feel I have at least a sliver of an excuse. 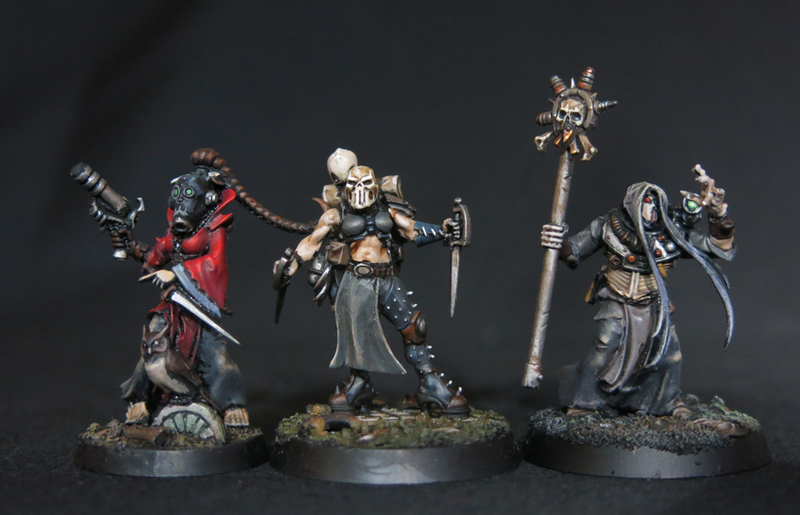 Hopefully soon I’ll have some Escher gangers painted up to show you and, although they wouldn’t be seen dead without their combat heels and form-fitting outfits, will at least serve to reduce the proportion of my troops with only one X chromosome. In the meantime here’s a group shot of my favourite females from my collection. Who needs Grey Knights? Three Imperial ladies taking on the worst filth Nurgle can throw at them. Of course this just leaves time to offer congratulations once more to Alex of Leadballoony for making Fembruary a “thing”, and to all the miniature’s designers willing to create female subjects beyond the impractical world of chainmail bikinis. Continuing my efforts to support the Nestorian infestation, and following on from the corrupted servo-skulls I showed previously I started thinking about the little cherubs we see flying around in the corners of Imperial artwork. Surely they too would fall under the sway of the genestealers and become a little more feral and spiteful than before. As you can no doubt see he still needs a bit of work to shape and smooth out the greenstuff but hopefully this gives you some idea of how he’s going to look. I think I’ll be calling it a day after this one and just concentrating on painting but we’ll see how it goes, there’s a few crazy ideas which never really made it to execution still scrabbling around in the back of my brain so who knows? In the initial brief for the Nestorian infestation Big Boss Redskulls noted that the infestation itself is spread by means of airborne spores. This is important because it leads to a very different situation than would occur on a normal infected world. Usually a person receives the genetic taint by means of the Genestealer’s Kiss, which means that the patriarch can pick and choose exactly who they want to enthral and infect. Not so here – spreading through the air anything which respires will soon be tainted, and as the tyranids are the ultimate genetic manipulators that means nothing is beyond contamination. Servitors, livestock, the native flora and fauna, even bacteria and viruses would fall under the sway of the cult. Imagine yourself on such a world with everything from the birds and insects overhead to the grass at your feet bent to a hostile alien will. Of course, as this is the Imperium that means infested servo-skulls as well. The first lady I’ll be adding to my collection then is this Imperial huntress, sent to infiltrate the genestealer infested world of Efesos VI and kill any targets of opportunity – including Nestorian himself if the chance arises. Like everything else in the Imperium it seemed likely that numerous different departments and Inquisitorial ordos would have an interest in Efesos VI, probably all without any knowledge of each other, and so there was no reason to assume that just because one Imperial force is inbound there aren’t others already in play. Of course with the arrival of the Deathwatch as part of the Nestorian Infestation game itself she may have been rendered rather superfluous but, assuming she doesn’t catch a bullet mid battle, if things go against the Imperial counter-invasion at least they can take comfort knowing there are still agents of the Golden Throne at work in the shadows. Of course everyone who falls under the cult’s sway becomes a true believer, regardless of what their feelings were previously, but this chap has become especially devout in his worship of the Children of the Stars and now he’s allowed to walk the streets openly he’s out spreading the good word of the saviours who shall descend in their purifying hunger from the heavens.